Calling our alumni is part of a strategy to maintain a long term relationship between our alumni and the University of Michigan. We strengthen these relationships by updating contact information, answering questions, having great conversations, and securing financial support for the University. In contrast, telemarketing is treated as a transaction. We reach out to alumni and friends, who are people who didn’t graduate from U-M, but who have relationships with the University. For instance, one day you could be calling alumni who graduated with a Law degree and the next day you could be calling a parent of a current freshman. 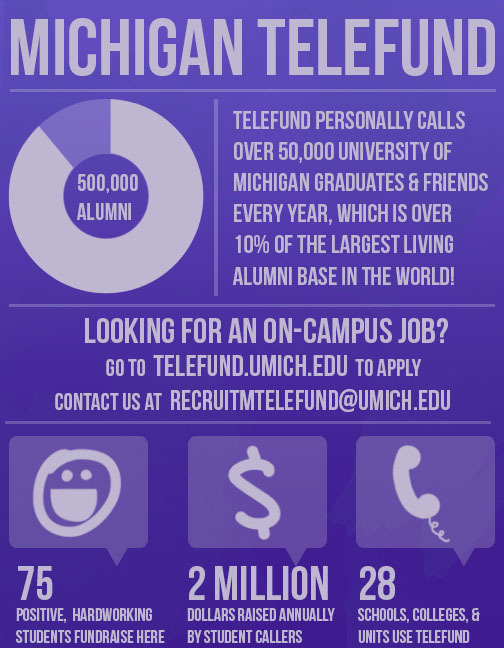 Each alum or friend has a unique set of experiences, and the best part of working at Telefund is hearing their stories! What will I be raising money for? 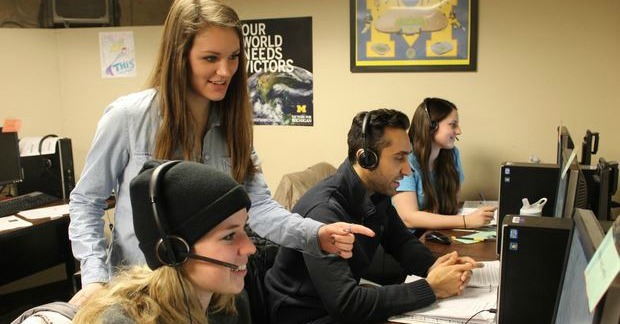 Michigan Telefund fundraises for a variety of purposes all over campus. For example, we have raised money for scholarships, programs, unpaid internships, and many of the great resources available on campus, such as the Museum of Art and the University Libraries! Our alumni and friends have many different interests across campus, and we strive to meet their desire to have a positive impact on this campus. What makes a caller successful? We define success in many different ways. We strive to promote a positive work environment, so a successful caller contributes with a positive attitude and supports his or her teammates while reaching nightly goals. We have goals that are set in training for each semester, goals that are set each night for the entire staff, and individual goals set for each caller depending on whom we are calling on a specific night! What kind of training will I receive before I start calling? Before they begin, team members complete two comprehensive orientation sessions that help them understand the Telefund culture and equip them with necessary calling skills. Team members will also have opportunities to participate in multiple professional development trainings.